Aqua Montserrat has expanded its offerings with a new all-inclusive opportunity for travelers who love to give back. Veta Wade, a local business owner and environmentalist is offering discerning guests it’s new AQUA BLUE experiences, an all inclusive Blue volunteer holiday package, covering everything from Freediving, outdoor education, ocean conservation, project leadership, and Montserrat culture. AQUA Montserrat’s bespoke packages are available to groups of 6 participants, and include accommodation, local travel and food (excluding flights). Prices start as little as £700 per week, 4 week packages start at £2,500 per person. These all inclusive experiences will appeal to individuals from around the world, ranging from gap year students to those in between jobs or research students interested in business administration, sustainable development and tourism or just for fun. “We are uniting ocean conservation, communities and sustainable travel, into one memorable holiday experience, ” Veta remarked. By experiencing AQUA Montserrat and their unique ocean kids club, FISH ‘N FINS you will get to insight into the vibrant traditional culture that underpins daily life on Montserrat on land and sea. You’ll experience genuine Montserratian hospitality and leave with friends and memories that last long after the blisters and bruises have healed. Other volunteers have assisted on customer bookings, learned to freedive, hunt lion fish, assisted in event planning, taught local children to swim, delivered conservation workshops and much more! 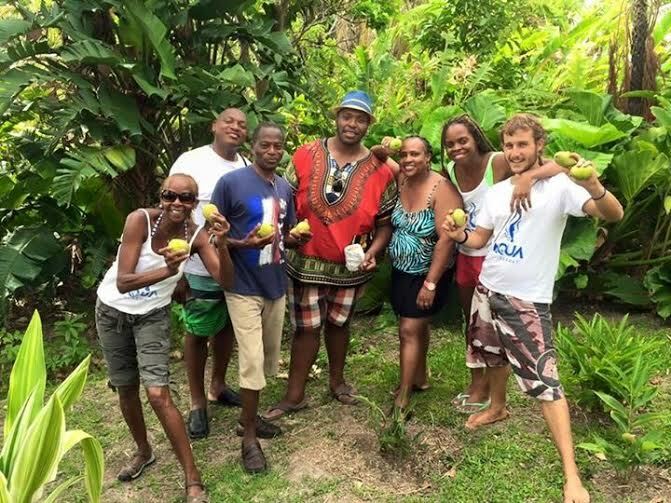 Once on island participants will also have the opportunity to work and blend with other like minded local volunteers, who have also experienced life enhancing fulfilment from volunteering on AQUA Montserrat’s projects. Projects such as ‘Fish ‘N Fins’ have garnered strong community support. Fishers, such as, ‘Poop’ Allen enthused, “what she ( Veta ) is doing is good for the island and especially our youth, we (Local Fishermen) will support her in whatever way we can.” Undoubtedly, AQUA BLUE participants will enjoy this life enhancing opportunity. If you would like to reduce the impact of your flight on the environment, you can purchase “offsets” from an organisation such as Climate Care (01865 207 000); www.climatecare.org). You can calculate the carbon-dioxide emissions caused by your trip, and contribute a sum to fund sustainable energy and reforestation projects – typically £10 for a long-haul flight. For more information, or to register your interest in one of our packages contact Veta directly by emailing AQUAMontserrat@gmail.com .